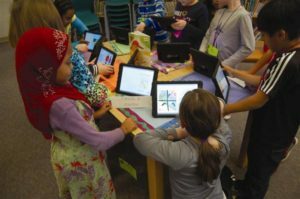 The initiative is rooted in the district’s mission: “Arlington Public Schools instills a love of learning in its students and prepares them to be responsible and productive global citizens.” To prepare students for an ever-changing world, APS recognizes the need to engage students in learning experiences that prepare them for the world in which we live. To meet that goal, which is part of our 2011-17 APS Strategic Plan, our teachers are committed to fostering a personalized learning environment where each student is challenged and engaged in relevant and meaningful learning. More information about Personalized Learning throughout APS can be found here. Students are exploring more creative ways to solve problems, express their ideas, generate new learning and develop skills to work as part of a team in the classroom and virtually.